Driving on the local roads in Ireland is nothing short of a constant adrenaline rush. We rented the tiniest car I have ever squeezed into and it would not be an exaggeration to say it barely fit in the lane lines of the local roads. Local roads have no shoulder; on the left (by the driver) is usually a wall of close-cropped hedges and there's about a two inch leeway on the right hand side before one veers precariously into the other lane. Each time we approached an oncoming car, I prepared myself for the surely-inevitable side-swipe. Fortunately, it never happened. But I considered it a small miracle to arrive at each destination unscathed. 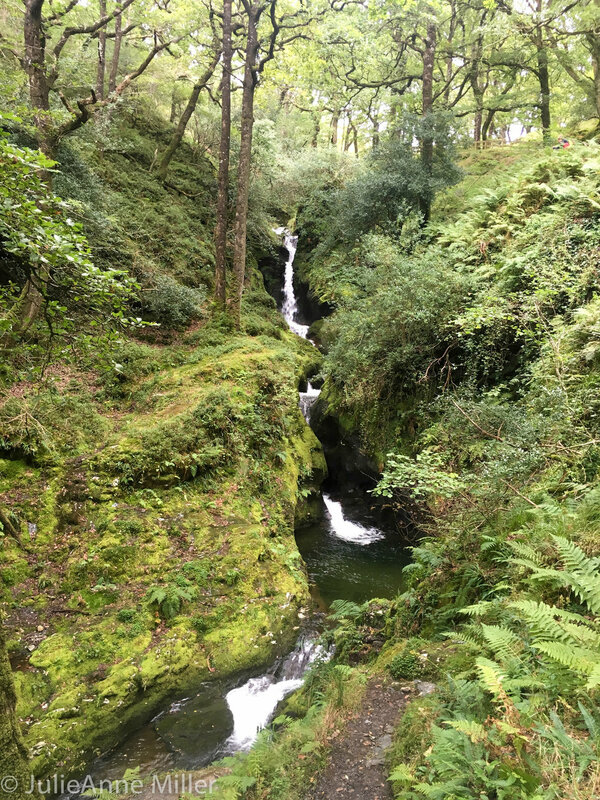 Our destination on the East Coast was Wicklow National Park, about an hour south of Dublin and the location of several commercial films, including Braveheart and Excalibur. 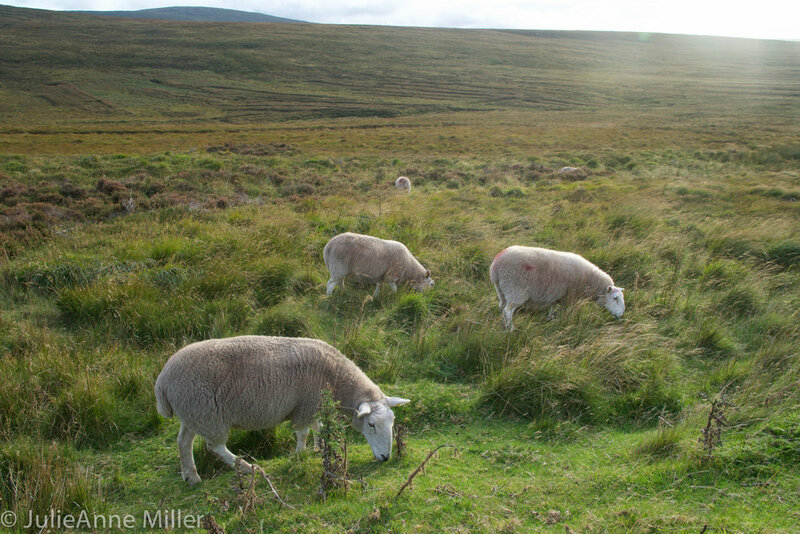 The primitive Fall scenery was a gorgeous mix of dense forest greens and yellow fields of tall grass dotted with sheep. We spent most of the day exploring Glendalough Monastery, founded by St. Kevin in the 6th century. At this site, an ecclesiastical village of Christian monks prayed, taught and lived for centuries until the Normans destroyed the monastery in 1214 A.D. We explored the tiny village town, wandered through the ancient cemetery and chapel, and then found ourselves on a wide trail. We followed the small crowd of fellow visitors past a boggy forest to a pristine lake carved by advancing glaciers during the Ice Age. From the lake, a series of trailheads beckon "hill walkers". We hiked up an aggressive hill, following a fast-rushing, narrow waterfall through towering evergreens. The ground was a soft and bouncy bog, lovely on the feet! 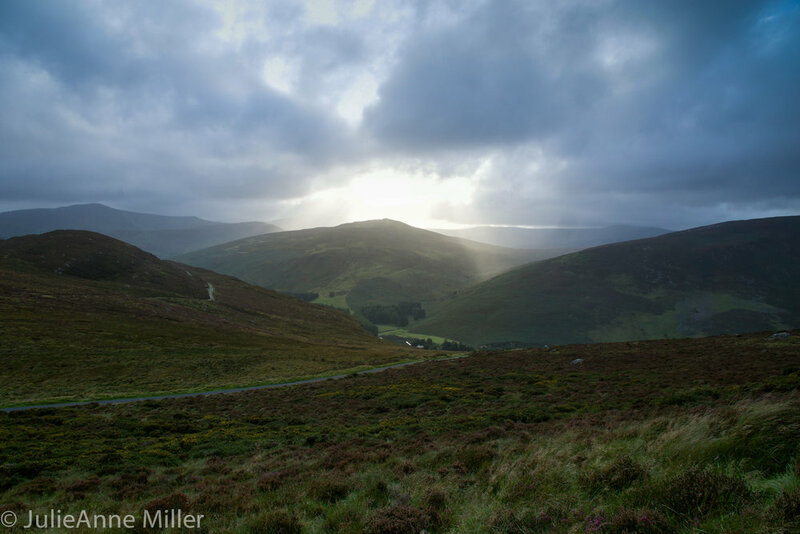 The path was a small section of the Wicklow Way, a long distance trail that takes about a week to traverse the valley, and comprises a portion of St. Kevin's Way, a pilgrim path that starts at Glendalough. 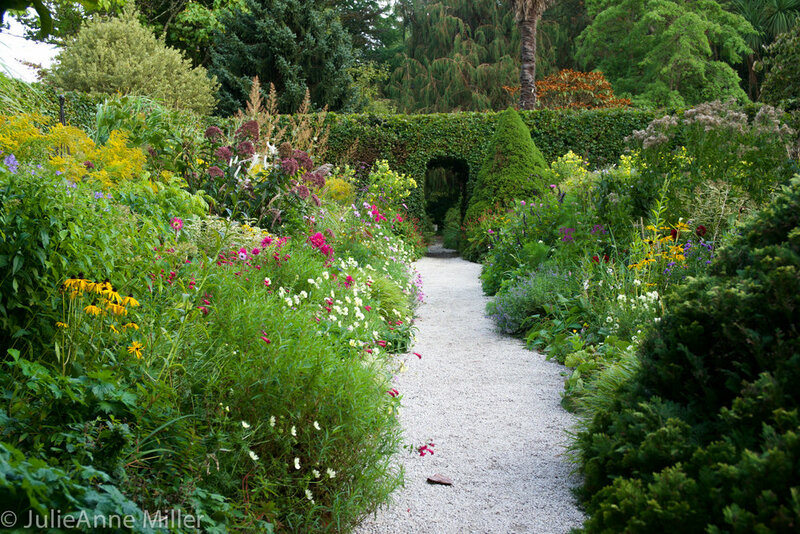 We added those trails to our walk-about bucket list for the future. Leaving Glendalough after lunch, we drove to the small port town of Wicklow to visit the ancient ruins of the Black Castle on the sea coast. The wind was whipping, but the sun was shining. We traipsed over the vibrant green fields of grass and explored the small rocky beach. Signs explained that the castle was built by the Normans during the middle ages, after 1100 A.D. It was constantly under attack by warring clansmen and was destroyed in 1301. The ruins remain. 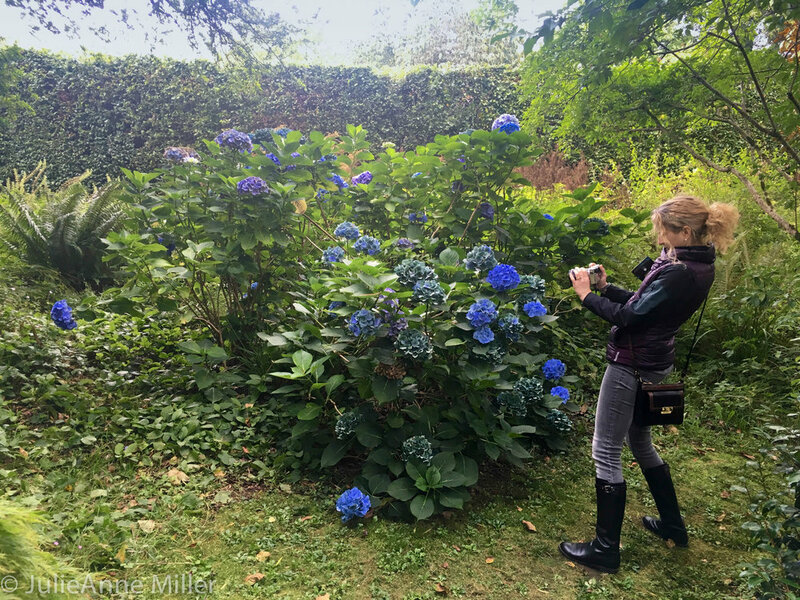 Before heading back to Athlon, we made a last minute stop at Mount Usher Gardens arboretum, which is famed for its "robinsonian" informal gardens. We arrived about 30 minutes before the park was closing, so we were rather rushed. Visiting in late Fall, the garden was definitely not at its peak, but we still enjoyed the variety of trees, water plants, and the pop of color remaining from late-blooming flowers. It would be worth visiting in the Spring and Summer, but I felt it was over-priced in the Fall. 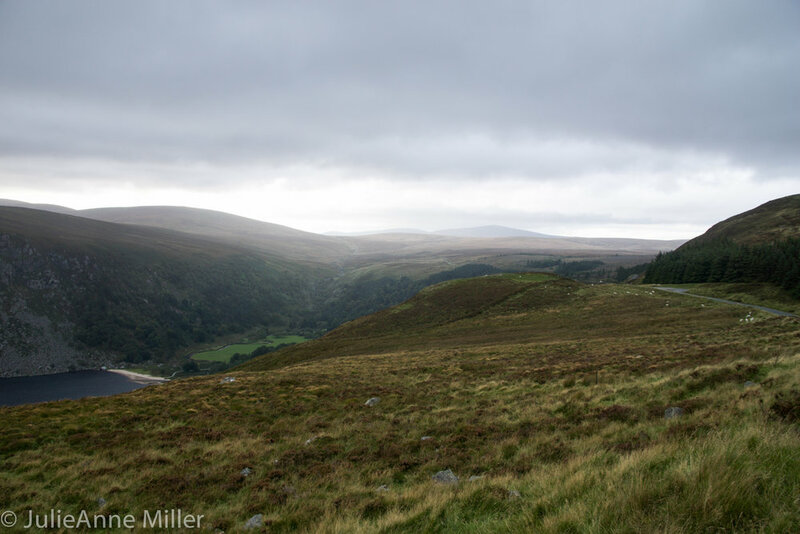 Our return trip to Athlon took us through Sally Gap, with astounding views of Wicklow mountains, glens, wide open fields of heather and grass, and glacier-carved lakes.